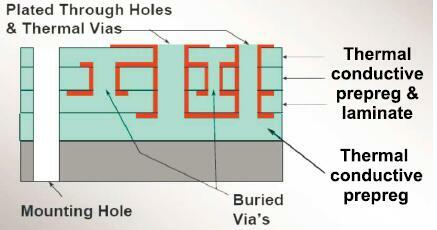 A MCPCB consists of a number of layers including a dielectric sandwiched between two metal layers. One of the metal layers, typically a1Ozto10Ozcopper foil, acts as a circuit layer for electrical connections, while the other serves as a heat spreader. Most of them are made of aluminum or copper alloy (Table 2), but iron alloy or even carbon is also available on the market. Choosing the type of materials as a heat spreader lies on the applications of the Metal core PCB, for instance, aluminum should be used if a lighter weight of MCPCB with gentle heat dissipation is required. By contrast, copper offers higher heat conductivity, in other words, higher heat dissipation rate, but it is heavy in weight. 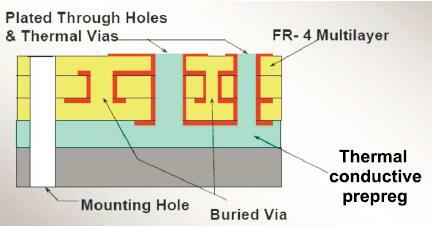 There are various construction designs of the MCPCB available on the market (Figure 1). The most common types of MCPCB are the single layer and the two layer MCPCB. The former is simply fabricated by print and etch on the thermal core laminate. The latter requires an additional pressing step to laminate the imaged thermal conductive laminate and metal base (also known as metal core) together. 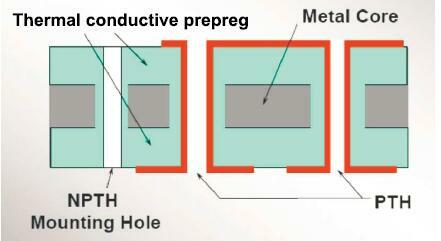 This is similar to the processing steps of producing multilayer and hybrid MCPCB. 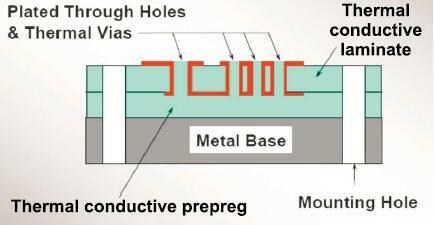 The processing steps of the MCPCB with the metal base embedded in the PCB are comparatively complex as hole plugging is required after primary drilling on the metal base in order to isolate it from the circuitry.